It appears that the criminals exploiting our notoriously “not very secure” Southern border have a new tool in their arsenal. Vehicles bearing fake logos of the Border Patrol, Fedex, DirecTV and everyone’s favorite source of outsourced goods, “Walmart” are being used to smuggle illicit merchandise and human beings across the border. A fake U.S. Border Patrol van was found to be carrying 31 illegal aliens in Casa Grande, Ariz.
“Neither emergency service vehicles nor any government vehicles are exempt from terrorist or other criminal use,” the report warns its law enforcement readers. The ABC report didn’t have much source information about this case so I decided to do a little digging. I started at the Border Patrol site — and although a found press releases with an impressive (overwhelming) amount of illegal activity they are catching — I couldn’t find anything on cloned vehicles. Sadly enough, we are seeing border patrol agents pay the ultimate price trying to defend our borders, and as most people know two of them are in prison for shooting a known drug smuggler. Digging a little deeper, I found a story on WFAA TV (Dallas) by Rebecca Lopez with more detail on this. Both reports reference a report (I couldn’t find) from the Texas Department of Public Safety. Of note, there is concern that terrorists could use this method to obtain entry (or worse) into the United States. The report referenced has allegedly been passed out to law enforcement agencies nationwide. The WFAA story also references a cloned vehicles fact sheet put out by National Insurance Crime Bureau. Apparently cloning vehicles is a known method used by auto theft rings to fence their stolen merchandise. Recently, there was quite a bit of uproar over Mexican truck drivers being given carte blanche access to U.S. roadways. Sadly enough, with cloned vehicles and the easy availability of counterfeit documents (identification) — it might be difficult to tell which the difference between legitimate and illegitimate truck drivers. I’ve covered counterfeit documents, as well as, the ease in which they are obtained frequently on this blog. A lot of these posts reference Suad Leija, who has been covered frequently in the press regarding the assistance she has given the government in exploring the problem we face with counterfeit documents (paper weapons). Suad assisted the government in their prosecution of the largest counterfeit document cartel operating in this country. The case is still pending in court. ABC News story by Brian Ross, here. Of note, boingboing, which a much more popular blog than this one linked to the Brian Ross story on this, also. My daughter and her partner sent me the boingboing link, which inspired me write this rant. WFAA did a video presentation of this story, which is on YouTube, here. 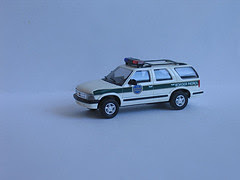 No user commented in " Cloned business and law enforcement vehicles used as a smuggling tool "